Jacob van Loo settled in Amsterdam in 1652 where he worked until 1660, at which date he was obliged to flee to Paris to escape justice following his possible involvement in a serious crime. Van Loo painted history and genre scenes and portraits, primarily devoting himself to the latter genre from the 1650s. 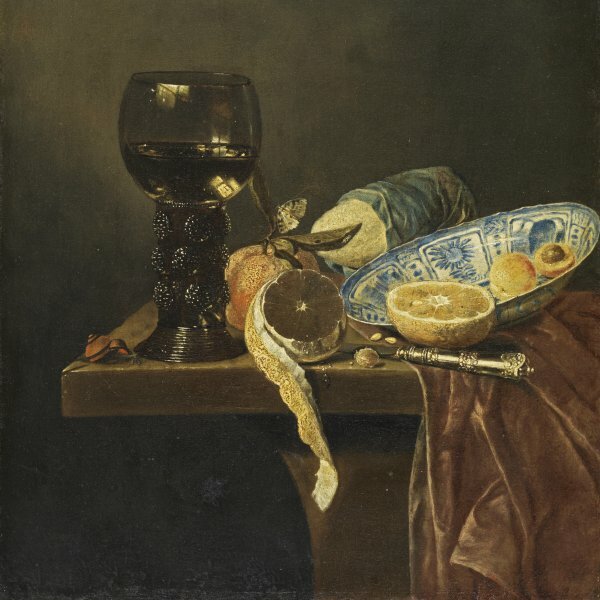 From that period onwards he is considered one of the most important painters working in Amsterdam, along with Rembrandt, Van der Helst and Kalf. 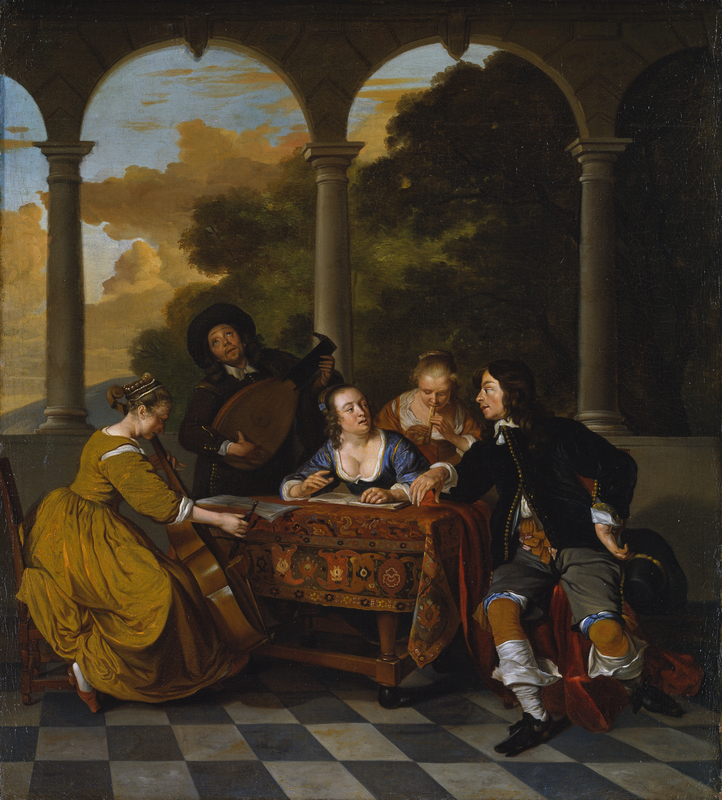 Together with Gerbrand van den Eeckhout, Van Loo developed a new genre known as the “conversation piece” in which groups of figures appear in informal gatherings, chatting and playing music. Through these amorous scenes Van Loo analysed the relationships between the different members of the group. Various examples of this type are dated to 1649, including Concert with four Figures in which we see two couples around a table in a dark interior, one couple making music and the other flirting. Group of Musicians is a work of this type, with the young people engaged in a happy, relaxed gathering on a terrace. A table covered with a richly coloured carpet is the axis around which the musicians are informally arranged. On the left the artist depicts a young woman in profile playing the ‘cello and opposite her another woman seated at the table and singing with a piece of music open before her. The composition is terminated on the right by a man beating time with his hand on the table and looking boldly at the woman who is singing. The spatial recession is emphasised by the colour of the floor tiles and by the screen formed by the arcade behind the terrace, through which we can see a sketchy landscape. The Hermitage in St. Petersburg has an oil of a similar size and subject. The differences between that work and the present one are few but significant, such as the different relationship between the table, the figures and the checkerboard floor and the type of arcading. The sizes of the two canvases are also slightly different. Previous catalogues of the Thyssen-Bornemisza collection have stated that the St. Petersburg painting is a replica of the present one or a copy. Gaskell, however, examined both works in depth and noted various compositional changes in the Hermitage painting that are not to be found in the present one. He also considered the latter to be better painted with regard to the faces, particularly the man on the right. He thus argued that the St. Petersburg canvas was the prototype for the present one, which is an autograph version. Naumann dated the present canvas to around 1650 and prior to 1652. Gaskell, however, noted that Van Loo continued to use this subject until 1659, the date of the painting in the Rheinisches Landesmuseum in Bonn, and thus dated the present canvas to prior to 1660.